From a distance I though I spotted some Toothpaste Slime Mold but closer observation left me a bit disappointed. There was nothing to “pop” and no “orange juice” to be had. Poking them only broke off the caps and revealed gills. About the only thing I knew for sure is these weren’t fish so I went to the G+ Mycology Community to ask if anyone could identify my discovery. Turns out these mushrooms are common in my area and grow on dead hardwood. My best guess on the substrate is Maple since I found then in an old maple sugar bush. Of course I also checked out some mushroom sites and got a bit more info. The (non-fish) gills are marginate,meaning the orange color is mostly on the edge while the sides are white. If I had known at the time I would have tried getting a better pic of the gills. 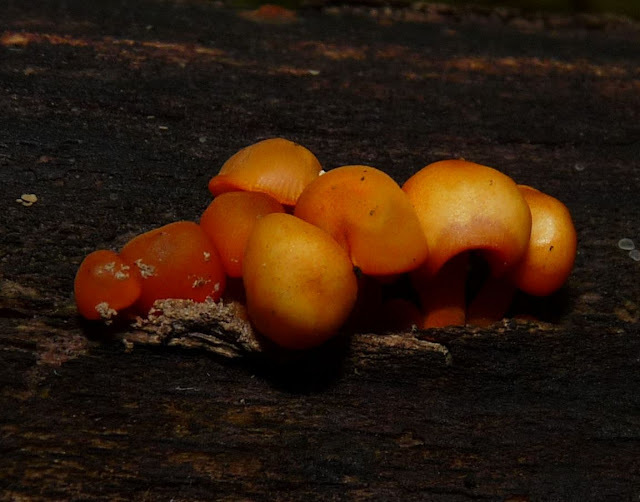 I knew they weren’t Velvet foot mushrooms, Flammulina velutipes because they don’t have the dark stem base or velvety stem. But they sure do look similar at a quick glance. 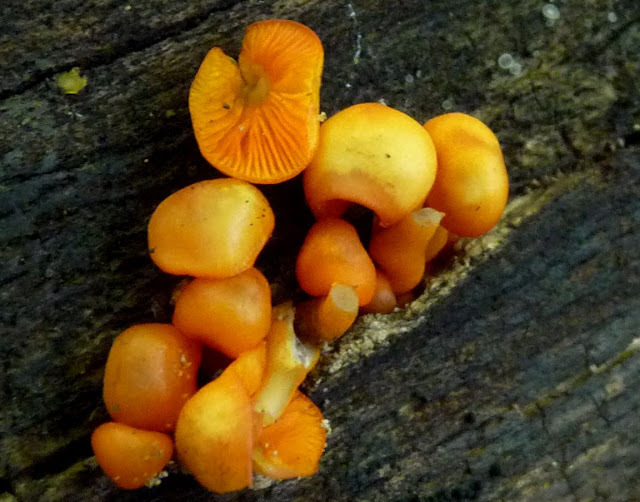 The orange mycena isn’t a edible delight either. My field guides say they’re edible or at least not poisonous. Some mention stringy or rubbery but I’m not about to try. I don’t eat fungus, I leave it to grow on my toenails. Very interesting about the mushrooms. I always like learning about them from you. I learned the most from you when I started out blogging. I’ll never forget it. You have always been my go to guy for fungus my friend! Glad your’re out there finding orange rubbery mushrooms instead of watching the fungus grow on your toenails. How about stopping by my place and doing an ID for me!